Hystrix patula, commonly known as Bottlebrush Grass, is a beautiful ornamental grass known for its attractive flowers. Also sold as Elymus hystrix, the Bottlebrush grass is rightly named for its long floral spikes that remind you of a bristled bottlebrush. 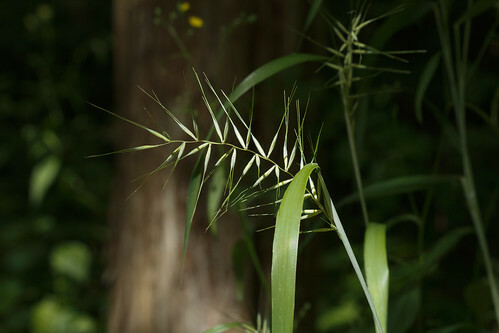 Hystrix patula is a tall grass that grows up to 1 meter and produces clumps of light-green leaves making it a nice ornamental grass for borders and flower beds. Green bristly flower heads appear in summer and last until fall. When in full bloom, Hystrix patula is loaded with bottlebrush-like flowers that stand out from its companions because of their attractive colors and unusual shape. Hystrix patula can be grown in almost any soil (loamy, chalky or sandy) as long as it is provided with moist but well-drained conditions. As a low-maintenance ornamental grass, Hystrix patula requires full to partial shade and grows easily from seeds.